Craig added although he wanted to leave his mark on the films, he was under no illusion he would have to eventually give up the 007 role. "I know there'll be someone after me, and hopefully someone after them - I'm just trying to keep [the series] going." There has been a four-year gap between the previous film Quantum of Solace and the new film. Production was temporarily suspended in April 2010 due to uncertainty over film company MGM's future amid financial troubles. But the actor said work had still been going on behind the scenes. "We haven't been resting on our laurels, we've been plotting what to do with this film," he said. "The first one was a whirr - it was a new experience and flew by - the second one was the tricky second album, but this one we've really planned and got a great script. "It's going to be different from the last one, but it will still be a great Bond movie." Filming has taken place in Shanghai and Turkey, but the action has now moved to the 007 stage at Pinewood studios. BBC entertainment reporter Lizo Mzimba had exclusive behind-the-scenes access to the set, and watched the "culmination of a big chase" scene on a set that recreated a London Underground station. 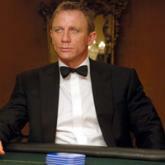 "Quite appropriately for the 50th anniversary Bond, a lot of the action is taking place in familiar London landmarks". Skyfall is due for release in the UK on 26 October.